When you’re in the mood to daydream over beautifully designed houses, Giannetti Home is a good place to do it. One of my favorite houses in architect Steve Giannetti’s portfolio is this traditional one on Broad Beach. 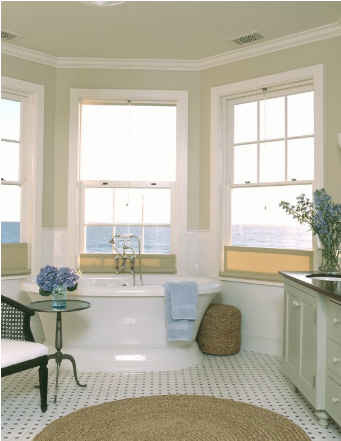 I love the the blue shutters outside, the gorgeous woodwork inside–and the view of the water doesn’t hurt, either. This house had me at the red Dutch door. Let’s take a look around! All of the details in this house are what kill me, like those built-in drawers in the bedrooms. Now you’re daydreaming, too, aren’t you? To see more photos of this house, visit Giannetti Home. 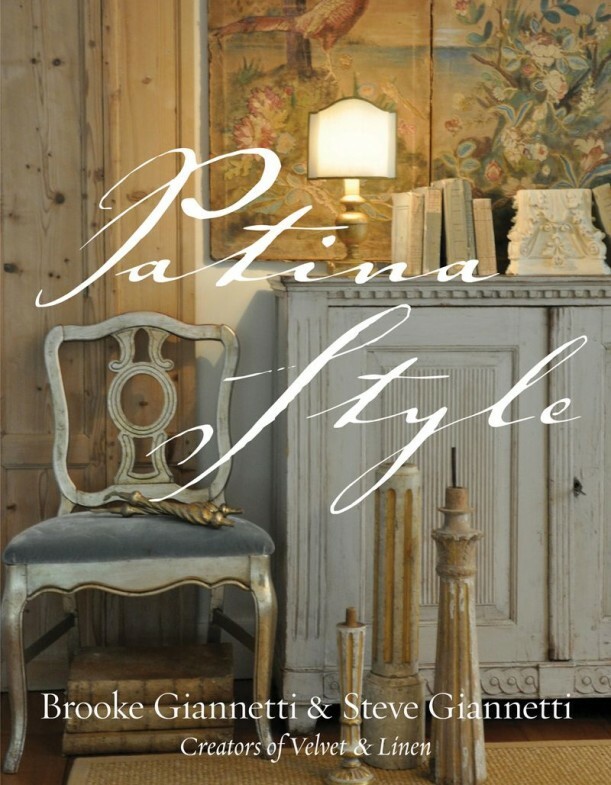 And be sure to check out Brooke Giannetti’s inspiring blog, too, at Velvet & Linen. By the way, what is a Dutch door? I am from the Netherlands but I didn’t know there existed something like that! It looks like a pretty common door to me (but then again, that might just be because I live here lol :p). we call them stable doors in England. That house is beautiful, I could definitely live there! Wow! Love love love it!! I want a beach house like that! or even just a Beach house period! Gorgeous Julia! Gorgeous! And it looks like there is even room for multigenerational families including plenty of grandkids fun! Thanks for a fun daydream. ok I just pinned about 48 of these images on my Pinterest boards – SO GORGEOUS. This is one of my favorites that you’ve featured yet. I can already tell I’m going to spend a lot of time checking this out. I just tried to register and I may have accidently “pinned” the Frequently Asked Questions” portion of their page to somebody’s account. I need a tutorial and then I think I’ll be Hooked on Pinterest. Thanks ladies! Hi Julia, I think that Gianetti can come over to the Dutch then in Netherlands, built me that house and I will make it mine at the Noordzee-beach…after all: the globe is warming up: we might keep Italian weather like we have had all april long. Thank you for this delicious post. Oh, Steven and Brooke are one of the best people out there! I so admire their work and I simply can’t say enough about Brooke, she’s just a sweetheart. I want. that. house. Wow!!! I love all the neat built-in bookshelves in the window seats. What a fabulously styled home!! Swooning here! How can I buy this house?!?! Or afford it for that matter. It is absolutely gorgeous! Oh, my god I think I am actually salivating. I may have to bookmark this page and come back on occasion for daydream time. The round breakfast nook….OMG! I love it! And surprisingly I like the striped yellow walls. I have to agree Julia…this might just be the perfect beach house…full of wonderful ideas too! This place is classically gorgeous. The “old world” details (translation=extremely expensive details) are just what I live for. The architect has great vision as does the decorator. However, I would like a property such as this to have a much larger yard so I could plant formal gardens and have “fantasy” areas. Ok , when do I move in???!!! Love it! A reading nook by the fireplace, a bathtub in a bay, a wonderful kitchen, beach and sea view and lots of blue and earth tones all over the house. What else can one ask for? Close to perfect… love the windowseats especially. Lovely! Lovely! With very few changes (some of the wallpaper), that would be very close to my dream house. Thanks for posting! That banquette is calling me! I’d love to curl up in there with my coffee, some pastries, and a good book with my family buzzing around me doing their day-to-day stuff. Love it! I love it. Wouldn’t change a thing. (Think Man of La Mancha … ) To dream, the impossible dream! L.O.V.E. it! All of it! Every “nook and cranny” of it! I LOVE this house! It is absolutely stunning. I love how its fun like with the Living room’s bright yellow striped wallpaper and the cozy breakfast nook. 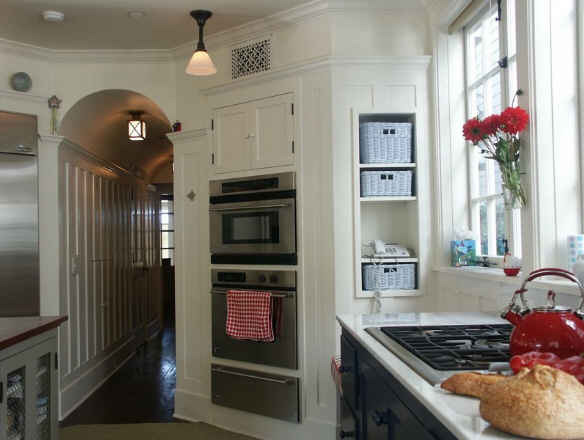 I also love that paneled hallway off the kitchen with the arched ceiling. Thats a really cool touch. When can I move in?? Brooke and Steve are two of the most creative and talented people I know! They always have a new project going. Patina Farm will be a masterpiece of French Country life. Sighhh. I could get lost in these pictures. It’s perfection. I can totally see myself living there!! I love reading Velvet & Linen and I love their work. Beautiful! wonderful dreamhouse; i’d die to live in such heaven! thank you for sharing this! 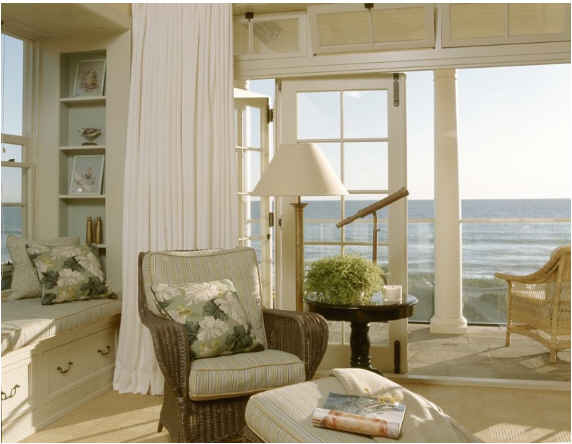 I absolutely love this beach house except for the wallpaper. Get rid of them, and this would be a great place to live. What a dreamy house! 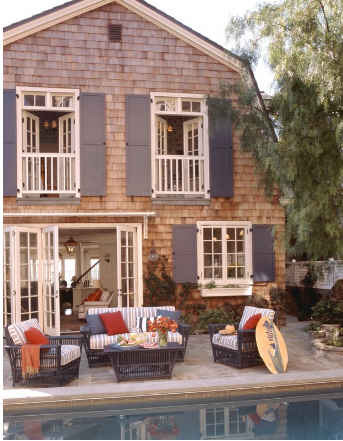 I love everything about it especially the blue shutters! wow…love a lot of that house, especially the blue shutters. i don’t think i’ll ever become a fan of wall paper. it’s just too busy for me. Oh me, oh my! A house couldn’t get any cuter! This is one of the happiest houses I’ve ever seen! Seriously, as I was scrolling through the pictures, the thought simply “popped” into my head that this is a happy house! It’s beautiful but I wouldn’t want to live ON the beach anymore with floods and tsunamis going on lately. This is absolutely the definition in pictures of H-O-M-E…..sweet home! I could move right in with only my toothbrush, my Prince… and my Terriers and live happily ever after. I’ve enjoyed looking at about a gazillion homes in my state of “Hooked” but this is now at the top of my “LOVE” list! Like your site 🙂 I follow their blog too and could easily live in ANY of their homes!!! Hope your week is treating you kindly!! I love this house! I am daydreaming tooooo.. This is my favorite house that you featured so far. Dreamy! Please let me live there. Is that so much to ask? OK where do I get me one of those…. Hi Julia this house is beautiful there is just one problem you won’t get any reading done the view is too dreamy. Thank you for sharing. Regards Esther from Sydney. I am officially in house lust. That is one beautiful house! Move me in…stat! I’m not sure there could be a house more suited to my style and tastes than that one. First, the proximity/view to the water, the finishes, the charming nooks & crannies, the furnishings, light fixtures, oh my. Did I see window benches and hydrangeas? I’m in! This house is beautiful inside and out, but the view of the water would be the most alluring part for me. I love being by the water. This is definitely my dream house! I love the light colors, the porch and that bathtub overlooking the beach, the kitchen. Wow! Simply stunning! That beautiful woodwork had me at hello! Julia thank you for sharing!